Green Smoothie Nutribullet Recipe to Lose Weight and Improve Health - Life is so Amazing! 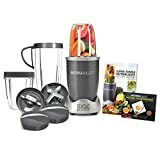 For years I've tested many Nutribullet Recipes and recently we ordered our third Nutribullet Pro Blender. Currently I'm drinking two Green Smoothies a day and my health continues to improve while I'm losing weight. A great balance between Happiness, Health and Abundance! Celery – I use the tops, greens and hearts, nothing gets thrown away! Mushrooms – Fresh not canned! The books The Four Hour Body and The Plant Paradox [WooZoneProducts asin=”006242713X,030746363X”][/WooZoneProducts] both suggest that too much fructose from fruit, can be converted to body fat if they are extra calories. That doesn't mean you're required to consume fruit and you're not going to fall apart! Just like fasting and cleansing, you need to go through periods without certain foods. I do have an avocado every day as well as an apple but no extra fruit at meal time. What are your favorite Nutribullet Smoothie recipes or ingredients? Comment below and let us know your favorite recipe and/or ingredients. As I write this I learned about the colon healing and cleansing using Senna. I've ordered the powder and plan to add to my Nutribullet Weight Loss Smoothies every day and I'll update you soon!